Turretinfan lays out an excellent refutation of a Roman Catholic video which accuses Calvinism of being a “heresy” by objecting to Limited Atonement. It’s worth noting that Roman Catholicism, Eastern Orthodoxy, and Arminianism all walk hand-in-hand in their embrace of an unscriptural synergistic soteriology, thereby rejecting the Biblical doctrines of grace which declare that salvation is by grace alone, through faith alone, in Christ alone, to the eternal praise and glory of the One True and Living God alone. In other words: “Salvation is of the Lord”. 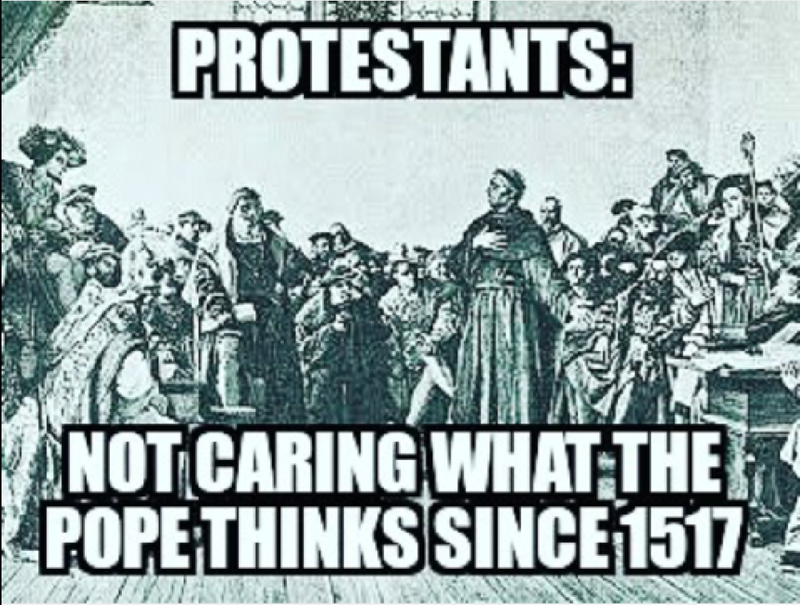 It’s important to realize in today’s climate of ecumenicalism and unity by all means that the Church of Rome officially cursed all Protestant Christians during Vatican I. Vatican I lasted for 18 years and was convened as a response to Luther’s 95 theses and the subsequent Protestant Reformation. The result of the RCC’s analysis of the Protestant’s doctrine was to change absolutely nothing as touching Rome’s doctrine, but rather to pronounce a papal curse upon those who held to faith by grace alone (as opposed to faith plus works as promulgated by the apostate RCC). So there you have it Christian. Can you embrace with open arms the apostate false-church that curses you and your faith in the Risen Lord of Glory? Can you simply shrug off the “minor doctrinal differences” between you and fellowship with your “Catholic brothers and sisters”? A PRAYER TO THE LORD OF GLORY: Lord may we be bold to stand upon your unchanging and eternal Word! Empower us O’ mighty King that we would not be deceived by the subtlety of the enemy who would ensnare us with his false doctrine and counterfeit unity; who would enter in secretly introducing destructive heresies! The enemy is as a wolf in sheep’s clothing desiring to rend the flock! Give us eyes to see O’ Lord and ears to hear your truth and your voice Lord, and let us not hearken unto another! Keep us Lord by Your power and strength and after having done all to stand, may we stand steadfastly upon the Rock of our Salvation and Your holy Word of Truth! Amen. I wanted to share the following comment I placed in the meta of another blog in response to a drunkenly indoctrinated adherent of the works-righteousness false religion known as Roman Catholicism. I posted this response after a papist named “Karl” dismissed any hint of a problem with a repulsively idolatrous hymn written about and sung for the Pontiff of Rome. Karl and I had been discussing the ground rules for an engagement to juxtapose the true universal (catholic) church of Christ and the imposter Roman Catholic Church, however after Karl’s demonstration of willful blindness about the utter inappropriateness of worshipping, praising, magnifying, and glorifying a sinful man I’m not sure there’s much hope for progress in any other area. Karl said: the lyrics are about as problematic as the lyrics: God save the Queen, Long live the Queen.” or the lyrics of the anthem: O Uganda may God uphold Thee, we lay our future in Thy Hands. However, i find it strange that mere lyrics concern you so much. How will the appropriateness, or not, of these lyrics determine your eternal destiny? Talk of vain pursuits! No Karl, this is no light thing, no vain pursuit; and the lyrics above are much, much more problematic than the examples you provided. As you will note the lyrics represent a HYMN (in this case a song of praise and worship sung by the Roman Catholic Church) FOR THE POPE! The examples you provided are worldly songs of praise and adulation to be certain, but by pointing to worldly idolatry and thereby insinuating that idolatry within the church isn’t problematic because, “Hey, they do it too!”, is totally unacceptable. Any true Christ worshipper should be shocked and offended that the praise, worship, and adulation of the church which is reserved strictly for the One True and Living God should be perverted and enshrined in a hymn that’s sung to and about a wretched, sinful, wicked man. This hymn is an abomination and speaks to the rank idolatry that lies at the heart of the Roman Catholic Church’s man made system of works righteousness. Worshipful praise from the church is due to God alone! What?!? The Pope’s rule is over space and time?!? This is excruciatingly blasphemous! God alone is sovereign over space and time because He created space and time; He is the Creator! The only creature craven enough to desire and savor this type of worship which is due to God alone is Satan himself! Blasphemy! Usurper! Again we see the stunning display of the utter depravity of this “hymn” which brazenly proclaims that the Pope sits in the seat of Christ! Christ alone is to reign and sit upon the throne of the hearts of men! But like a bad joke the hymn only gets worse. Now the wicked pontiff is compared to “The Shepherd” which of course is Christ’s own messianic title, and ill content with the praise of earthly men the song now shifts into full blown satanic hubris by marshalling the worship of all the earth and heaven to sing of the glory of…THE POPE!!! Karl I’m afraid if you can’t see the problem with this most basic of issues – to Whom the praise of mankind is due – then our discussion of anything further may be utterly futile. The Romish system of works righteousness must adhere dogmatically to the false belief that the atoning work of Christ on the cross is not finished or else the rest of their house of cards comes tumbling down upon their heads. This is the case because in their perverse view the RCC is the only instrument on earth whereby “sacraments” may be given and received. They must categorically deny Sola Fide because to do otherwise would be to remove the foundation of their false authority. If men are saved by grace through faith in Christ alone – as scripture plainly teaches – then the RCC loses its death grip on its deceived adherents. If men are saved outside the auspices and authority of the RCC – as they are to the glory of God alone every minute of every day – then the RCC must face the truth of its own irrelevancy. Hence the RCC must reject the finished work of the cross and assert Christ’s “continual sacrifice” because this is the entire point and meaning behind the mass and their myriad other sundry and false beliefs. Incidentally they also, by papal decree, demand idolatry by requiring the “adoration of the Eucharist” which is effectually giving worship to a cracker. To fail to worship the created instead of the Creator is anathema to the RCC. This is painfully blasphemous! And we need not delve into Mystery Babylon’s pernicious infatuation with all things Marian. They’ve simply committed spiritual whoredom with their devotion and veneration of a sinful woman who, though specially favored of God, was still in just as much need of a Savior as the most heinous harlot or murderer one can imagine. Lastly these blind leaders of the blind smugly invent false scriptures and then pretend they are canonical so as to support their otherwise unsupportable, extrabiblical, unscriptural, ungodly anti-christ system (i.e. the apocrypha). For more on the utterly apostate practices of the RCC I highly recommend that you peruse Mike Gendron’s archives over at Proclaiming the Gospel.